Good morning, sunny Sunday! 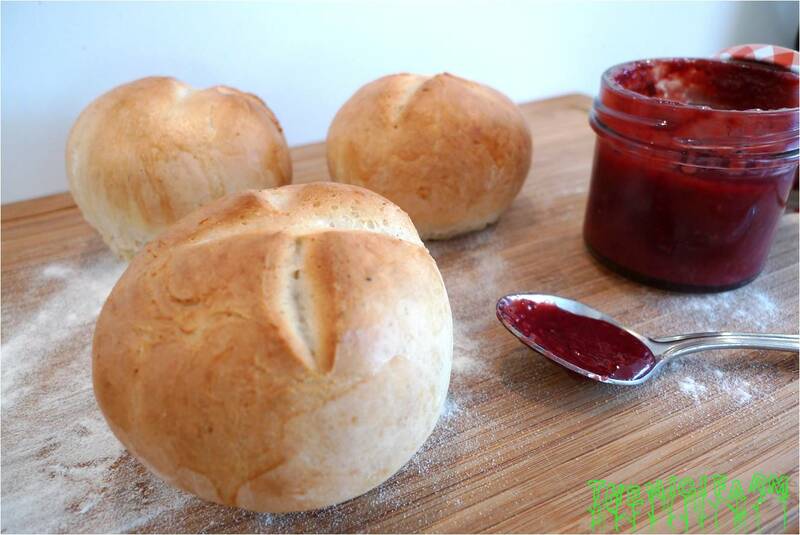 Rise and shine with self made Sunday rolls! Preheat oven to 200 °C. Warm milk with water in a small pot and melt butter inside. Let cool to hand warm temperature. Mix flour, sugar, salt and yeast in a large bowl. Press a mold in the middle and add milk-butter mixture. Starting from the middle mix in more and more flour from the side with the milk. Knead until it a flexible, non-sticky, soft dough has formed. (If too dry add water, if too sticky add flour) Make 5 balls and press them slightly onto a baking sheet. Cut a cross into the top layer with a sharp knife. Cover with a dish-towel and let rise for 30 minutes. Bake for 15 minutes. After 10 minutes brush with milk and bake for another 5 minutes. Take out of oven and cover with a dry dish-towel. Let cool.